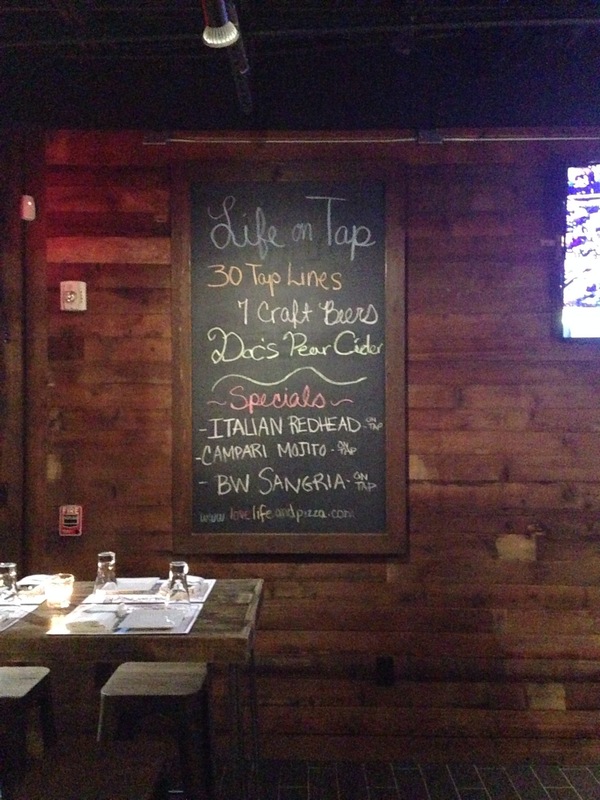 With 30 wines on tap – that’s right wine lovers, the wine is on tap – a fresh mozzarella and burrata bar, and wood fired, certified Neapolitan pizza, the newly opened Brick + Wood: Love Life (And Pizza) is certainly gaining some much deserved attention and praise. 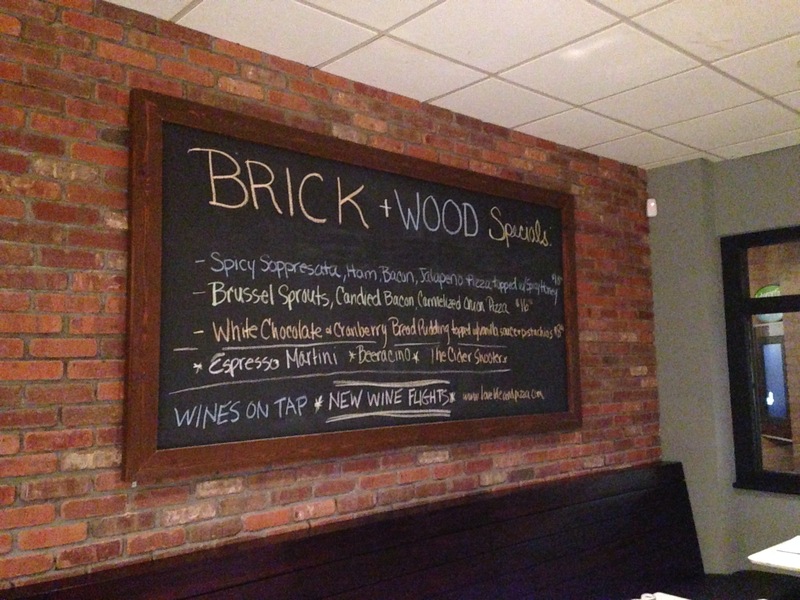 Can we talk about how much I love Brick + Wood? Everything we tried during our visit – EVERYTHING – was freshly prepared with a great amount of attention to small details and, quite frankly, it was delicious. 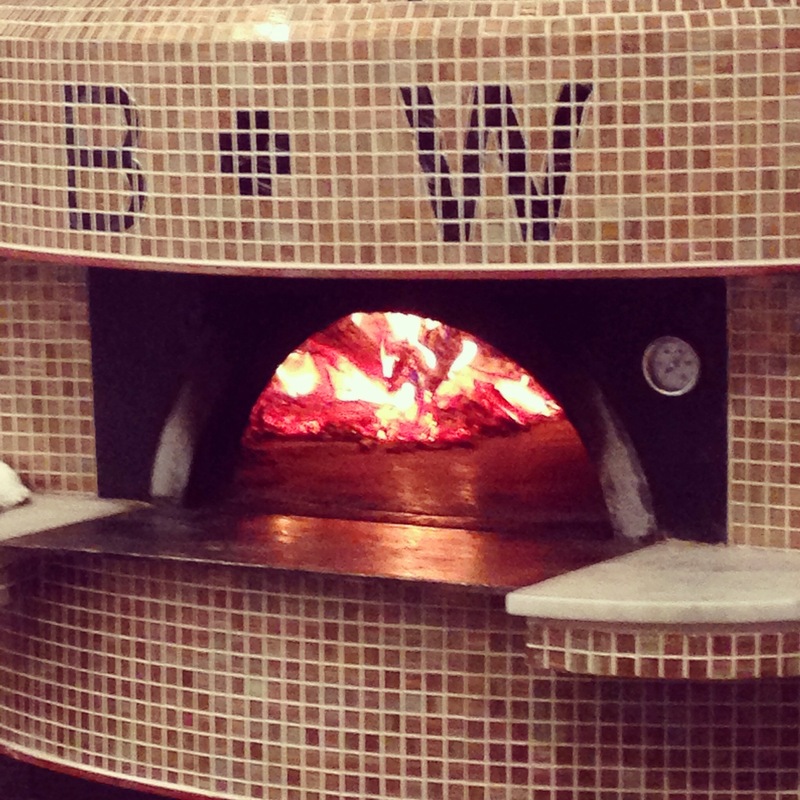 This beautiful balance of an intense attention to detail in even the most seemingly simple dishes with a comfortable atmosphere perfect for not only happy hour with friends or date night, but also a place for the whole family is what makes Brick + Wood just different enough from other pizzerias in the area. 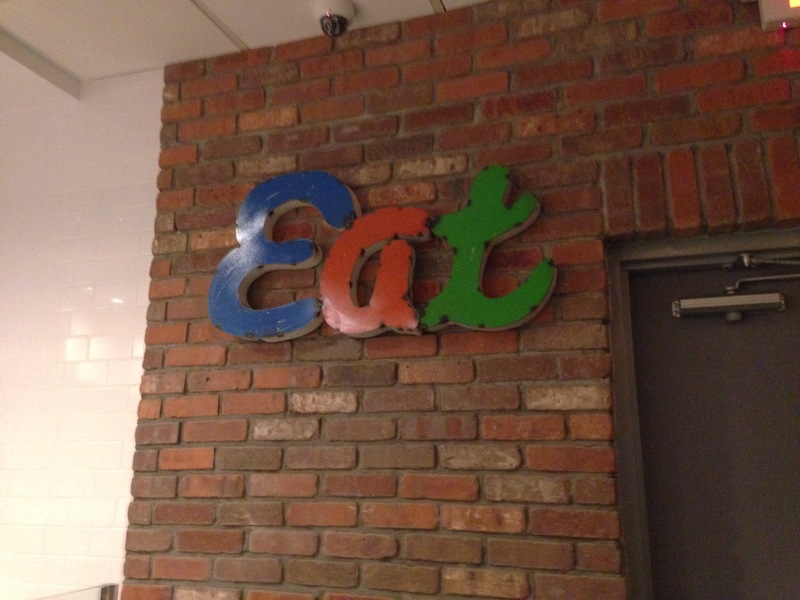 The other thing that makes Brick + Wood different is not only the philosophy behind the food which is right in the restuarant’s name – Love Life (And Pizza)! – but also the unique distinction of being certified by the Associazone Pizzaiuoli Napoletani (APN) that their pizza is officially Neapolitan pizza. 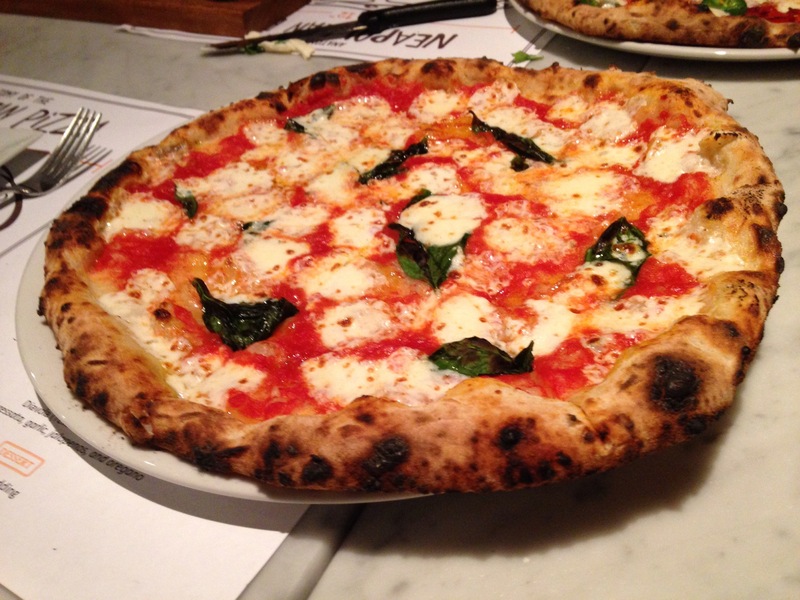 The APN, an association formed in Naples by pizza makers to preserve the authentic Neapolitan pizza values, requires a rigorous certification process for any restaurant wishing to serve authentic Neapolitan pizza and very few pizzaiolos in the United States are certified. Before we tried the pizza we started off in the bar area so we could experience a little of happy hour. 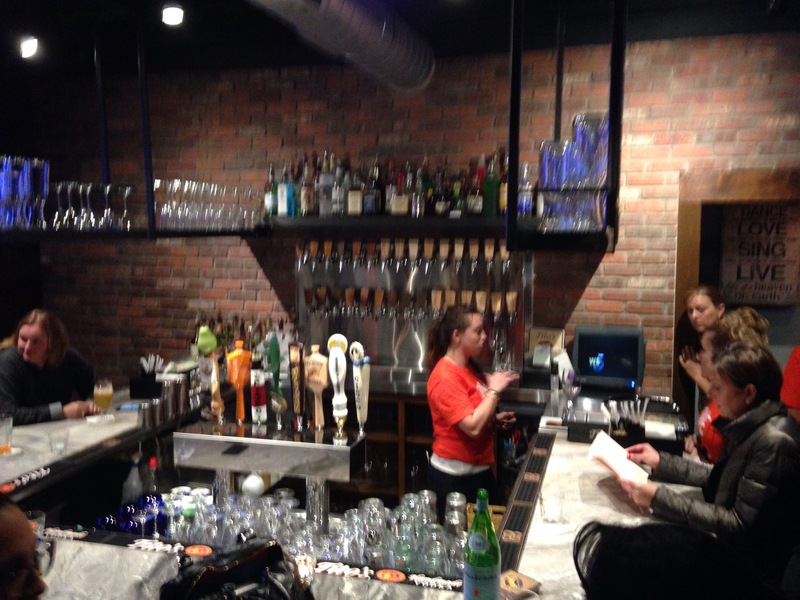 The bar side of Brick + Wood offers a few high top tables if you don’t prefer to sit at the bar to enjoy a cocktail ($8-12) or glass of wine-on-tap and some starters or “Neapolitan street food”. Our first cocktail was the Cider Shooter, a seasonal special. Some other cocktails I tried (you know, for the sake of testing them out to share with you, dear reader) included the Wood Martini, Sangria, a Wine Flight, and finally a dessert cocktail, the Piccola Toffee, but that was with dessert so you’ll have to read on! 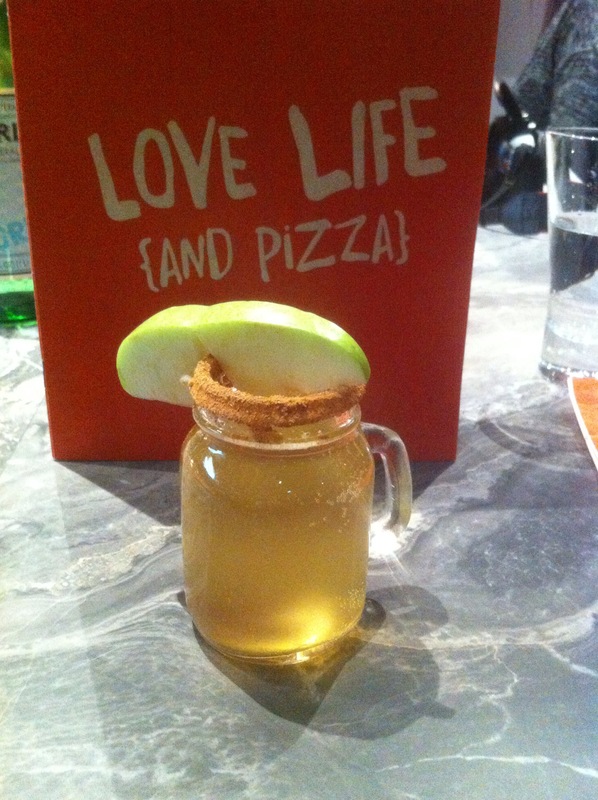 Yes, that is a sugar and cinnamon rimmed glass! 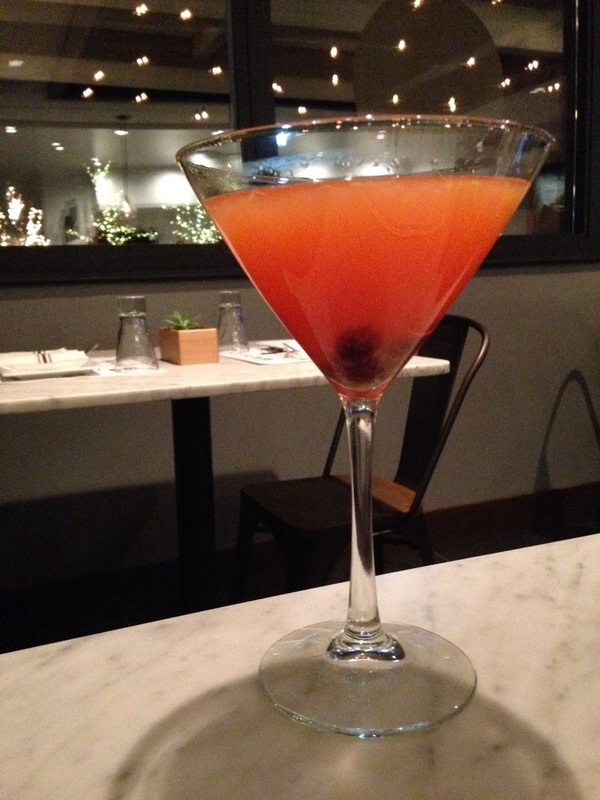 If tart and citrusy cocktails are your preference then the Wood Martini is a perfect choice made with orange vodka, orange juice, lemonchello, and dried cranberries. The Sangria at Brick + Wood is a game changer for me, meaning that I now have a new favorite! Sangria is predictable at most restaurants, but I was pleasantly surprised by the well-blended flavors in Brick + Wood’s sangria. 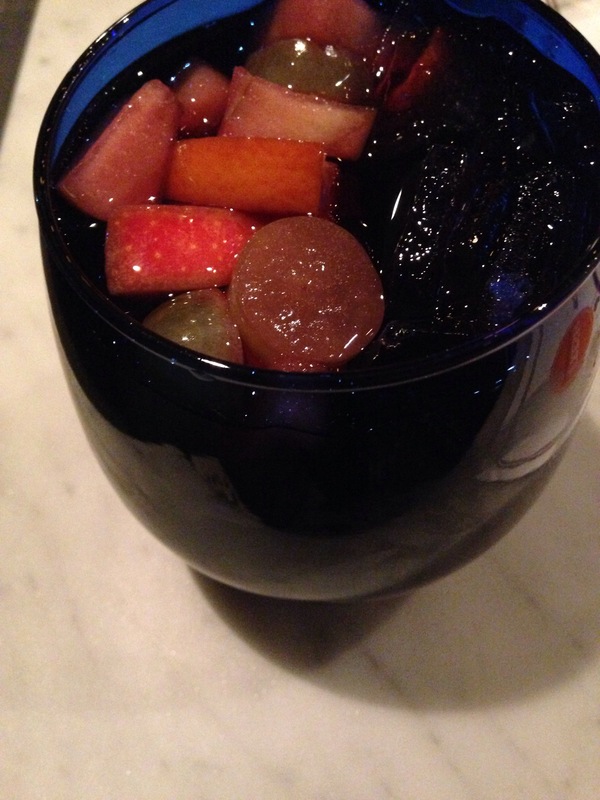 You can expect to taste the sweetness of the fruit and added simple syrup along with the wine. I should add that the sangria is on tap here too. Wine can be ordered in several different sizes: a 2 oz taste glass ($2.50-5.75), 6 oz glass ($7-12.75), 1/2 carafe (3 glasses) ($15.50-36), or a carafe (6 classes) ($27-62). With so many wine options it can become a little overwhelming unless you are quite the wine connoisseur and so I’d suggest trying a wine flight so you can sample a few. The wine flight is fun by itself or with some food. 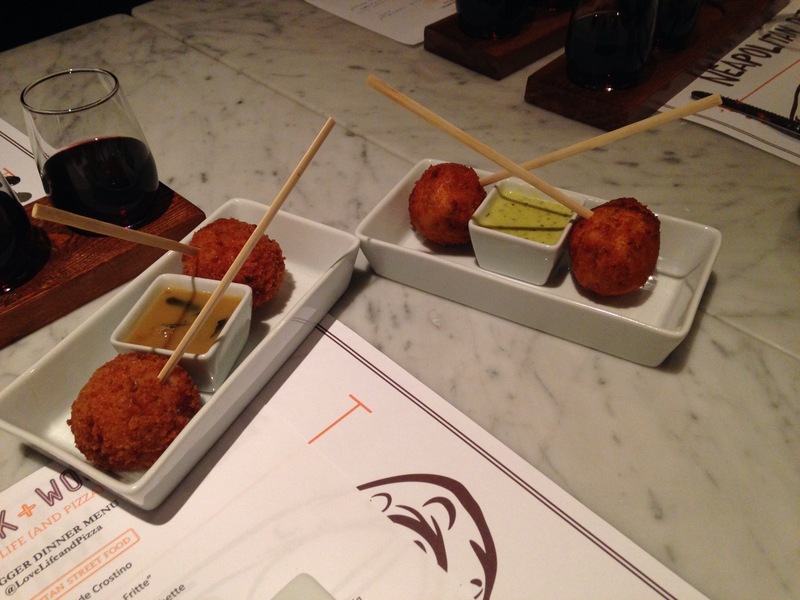 We had ours with some starters or Neapolitan “Street Food”! Neapolitan street food is finger foods you might see people eating wrapped in paper or parchment while walking in the streets or piazzas in Naples and the menu includes some favorites: Arancini, Potato Crocchette, Fried Calamari, Panzerroti filled with salamino, and fresh mozzarella, and basil ($4.50-13). 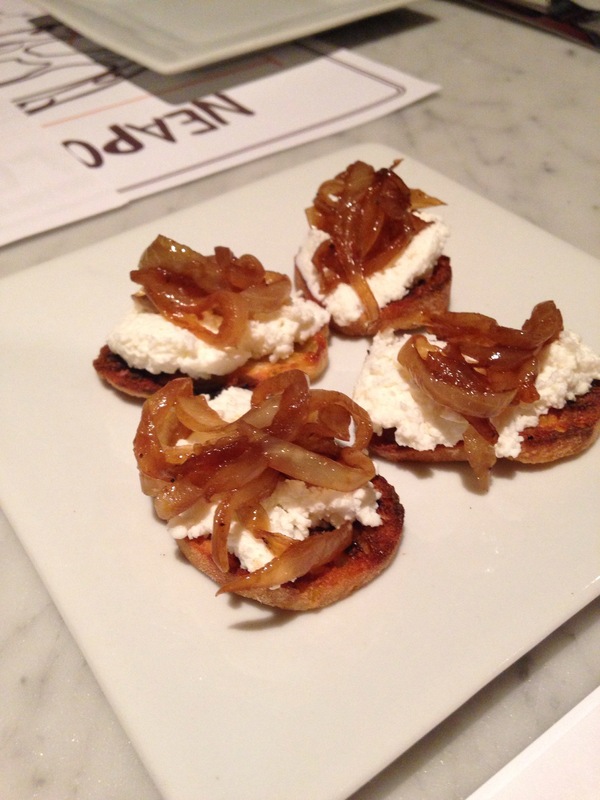 Made with ricotta and caramelized onions on top of little toasted crostinis, the freshness of the creamy ricotta compliments the sweetness of the caramalized onions and the crunch of the crostinis in the House Made Crostinos. 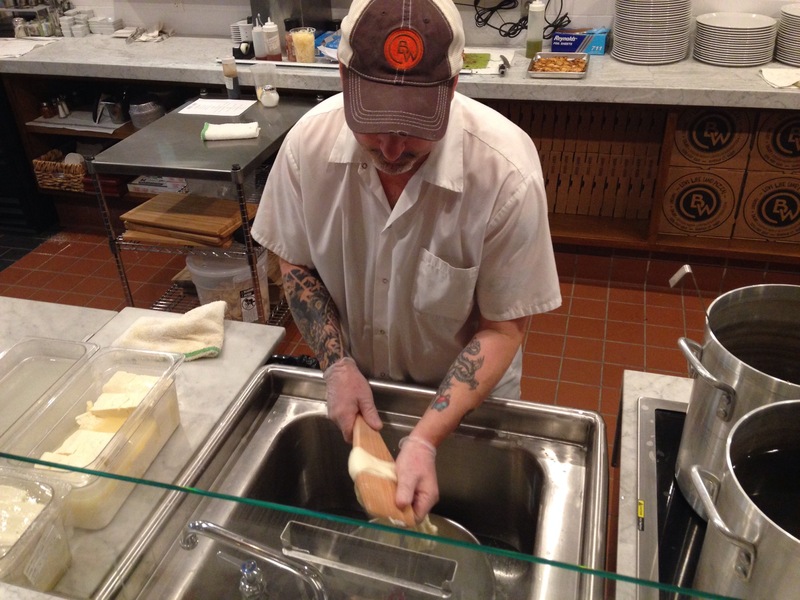 What is unique to Brick + Wood is their cheese bar where all the cheese they use in all their dishes is made fresh to order. Freshly made ricotta, or any other cheese we tried while dining at Brick + Wood, takes on a slightly different flavor when it is that fresh and it’s something worth trying. 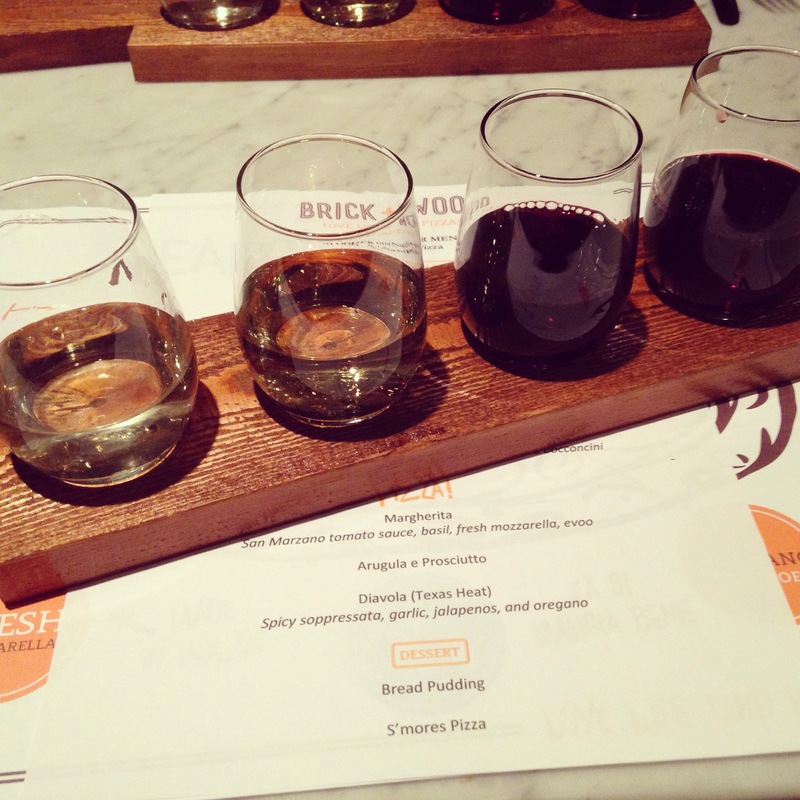 In fact, I would go to Brick + Wood just to try all the different options with the cheese bar (read more below). 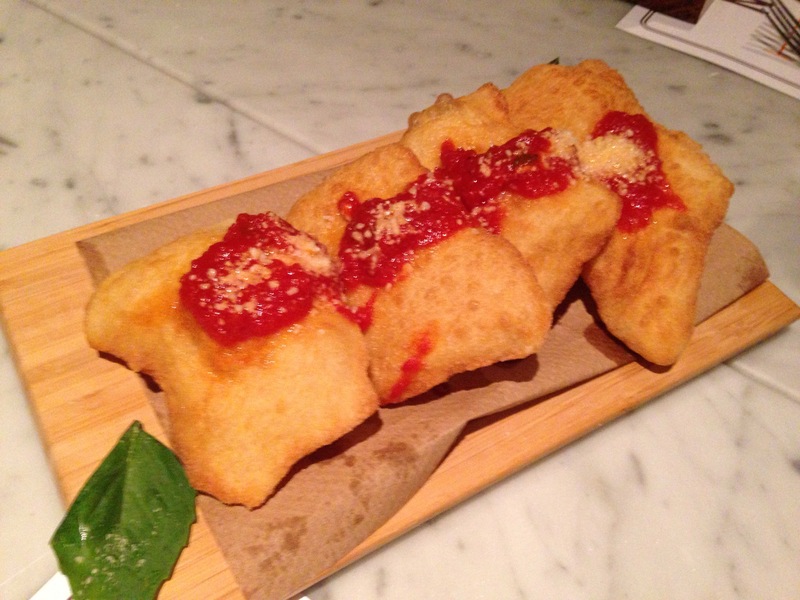 Think fried dough meets your favorite pizza sauce and you have the Montanara “Pizze Fritte”. 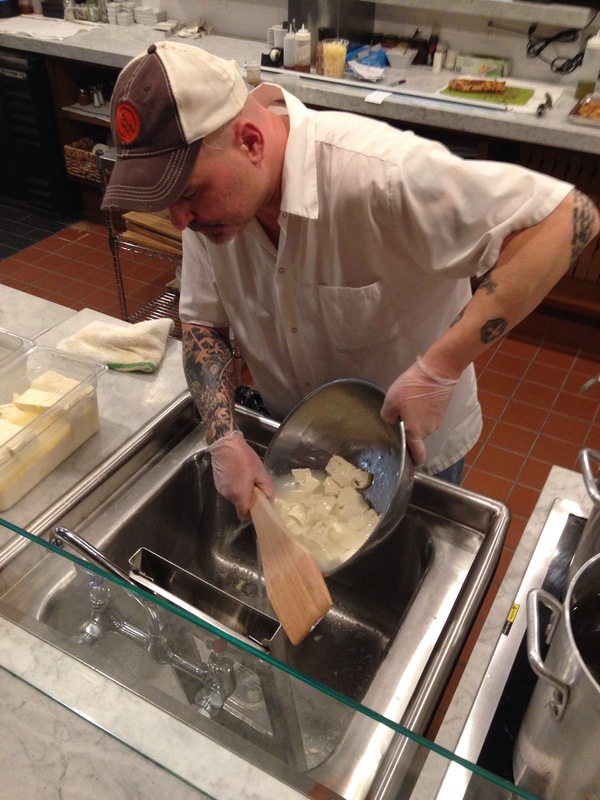 Using homemade dough that has risen for 24 hours and homemade marinara sauce, the “Pizze Fritte” exemplifies the Paolo’s and Clara’s goal to bring Neapolitan street food to Fairfield. I can imagine buying this and strolling through the streets of Naples. You can expect a slightly chewy consistency, however the “Pizze Fritte” is not greasy, and the delicious maranara make this starter a hit. 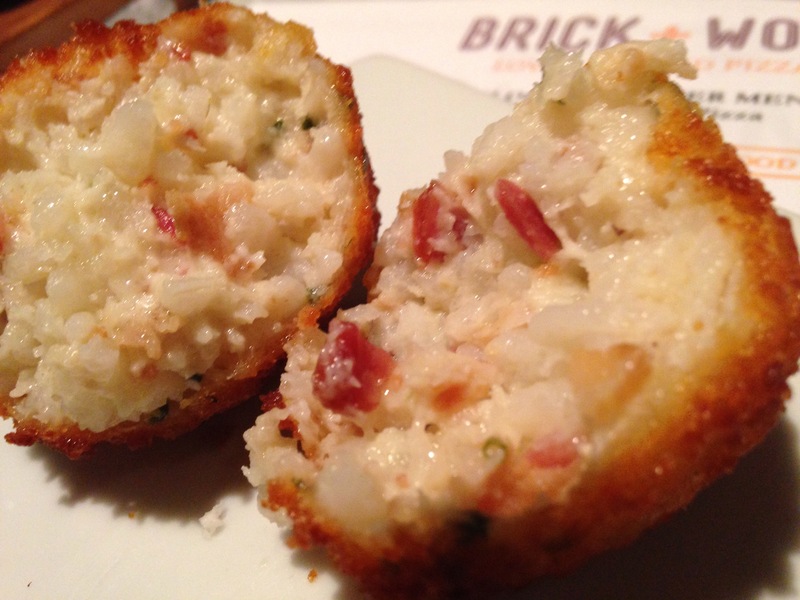 I didn’t want to stop eating the Loaded Baked Potato Crochette! Bacon, sourcream, chives, mashed potatoes, served with a white bechamel sauce make up this amazing appetizer – what’s not to like? The Crochette is a little on the heavy side as you would expect to feel when eating mashed potatoes, yet it is very delicious. 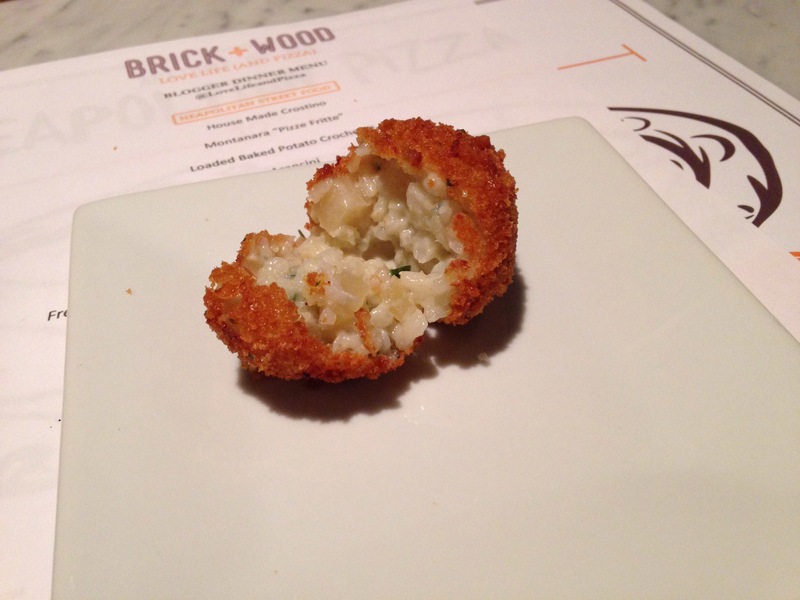 Arancini balls are another must-try at Brick + Wood! We sampled two kinds: Bacon Jalapeño made with fontina cheese and served with a jalapeño dipping sauce, and Pear Gorgonzola which is served with a brown sage sauce (butter, brown sugar, and sage). 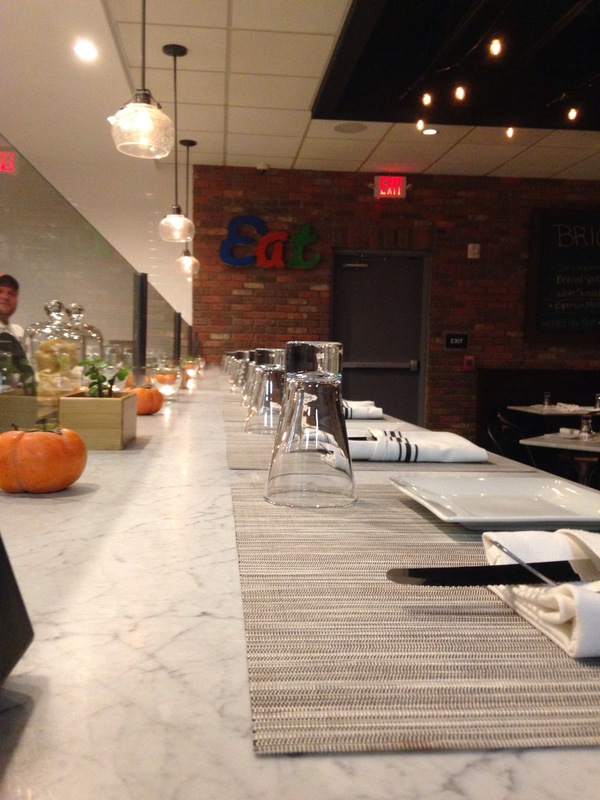 Mozzarella, burrata, and more is made throughout the day at Brick + Wood. Hand-pulled right in front of your eyes you can enjoy the freshest cheese in a variety of creative combinations from Caprese to Truffle Burrata ($10-15) and include imported dried and cured meats such as capocollo, mortadella, prosciutto and salami which are thinly sliced to order. When I dream of cheese (I know I’m not the only one who does!) this Truffle Burrata is now something that pops into my brain. 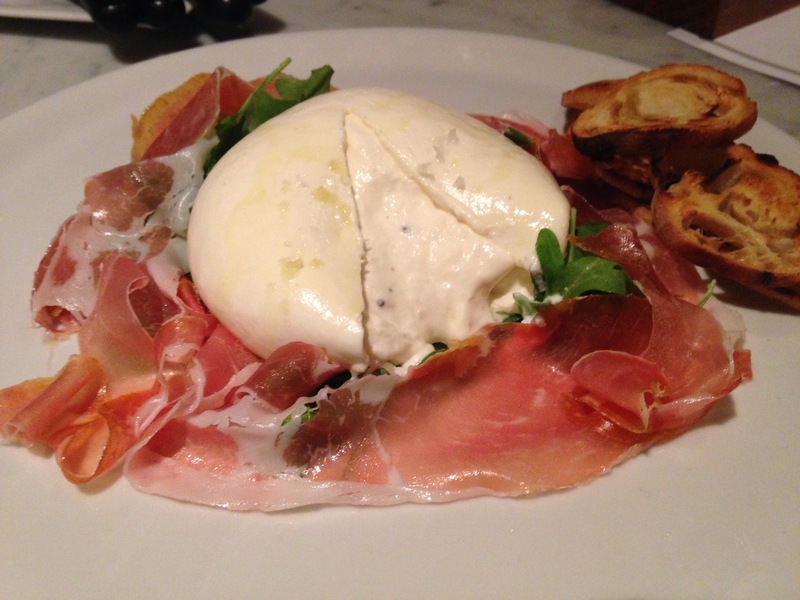 Fresh mozzarella with a cream and truffle filled center comprises the burrata which is further complimented by the slight saltiness of the prosciutto and the texture and flavor of the arugula. 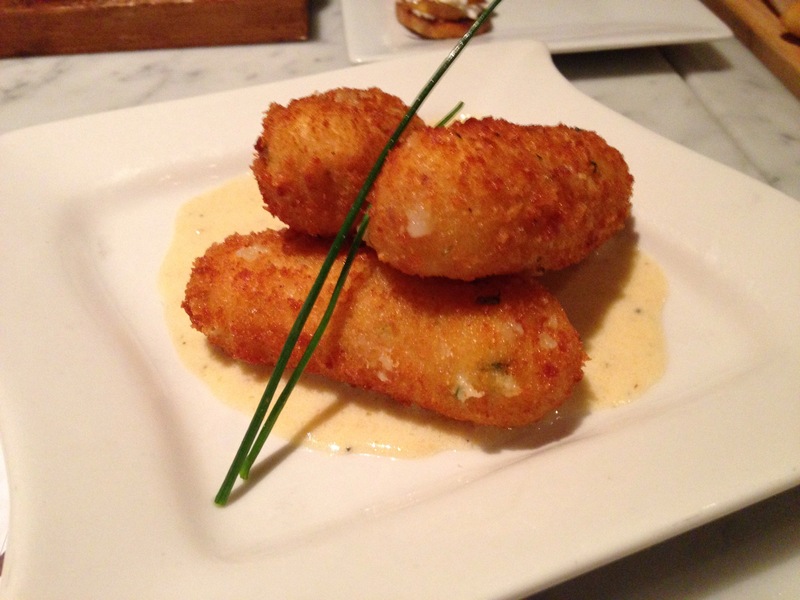 Add the crunchy crostini as a base to build upon and this appetizer is rather perfect. 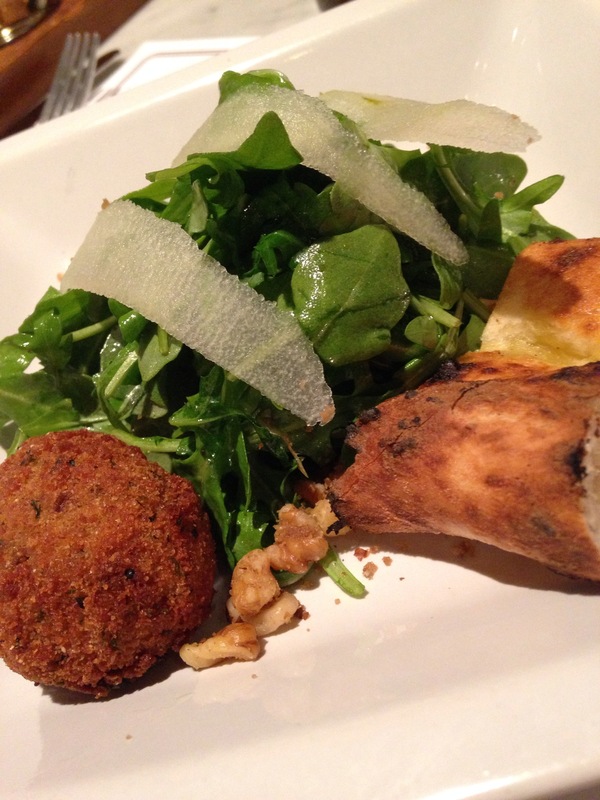 The Arugula Salad at Brick + Wood pairs argulua with shaved pears, candied walnuts, maple vingaigrette, and a fried bocconcini (or fried mozzarella ball). The maple vinaigrette adds a slight sweetness that the candied walnuts build upon making this a very interesting and tasty salad. To owners Paolo and Clara Cavalli their pizza is a “labor of love” and they take the process very seriously. 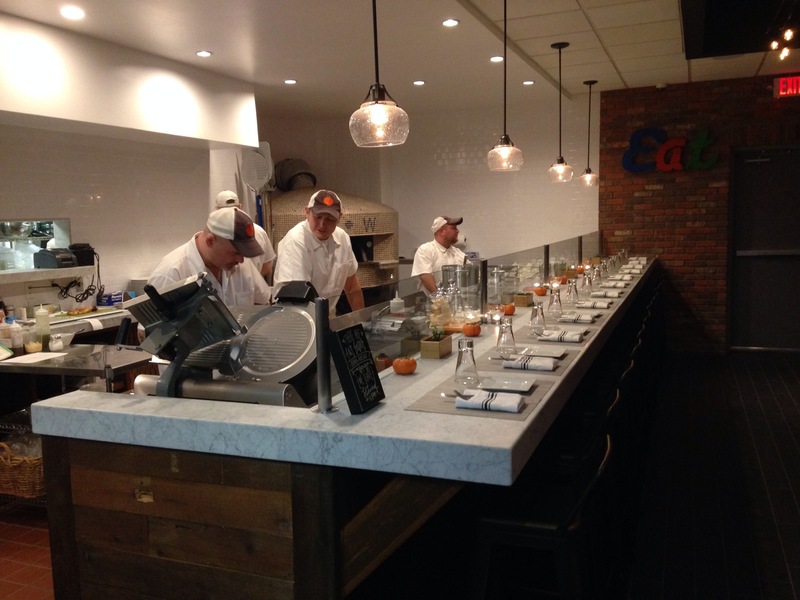 The dough is handmade on the premises and leavened for 24-28 hours before it is hand tossed and cooked in the 900 degree wood-fired oven for about 90 seconds. Aside from the dough, housemade sauce is made with San Marzano tomatoes imported from Italy, fresh basil, and of course, the fresh hand pulled mozzarella all are used when making a pizza at Brick + Wood. An array of toppings can be added from the classic to the more creative. 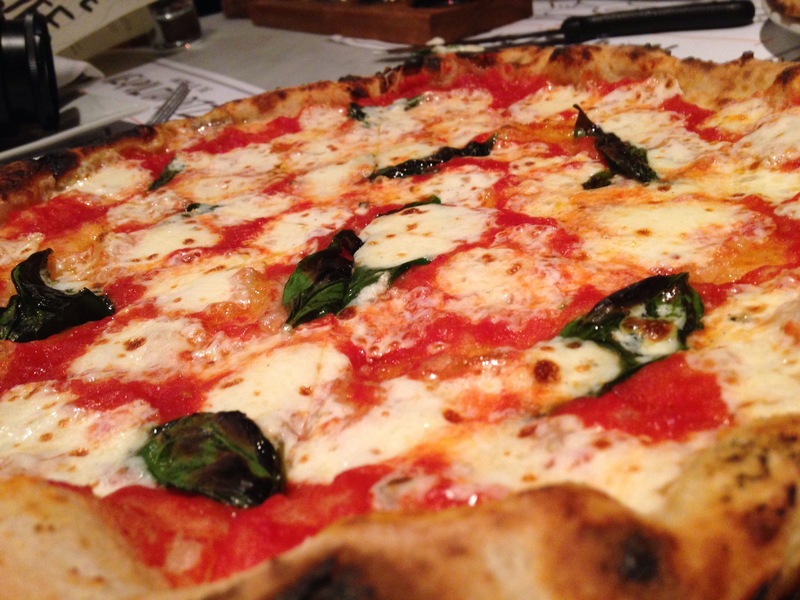 Margherita pizza is a classic and I like to use classic dishes and flavors to help me consider how I feel about a pizza establishment (or any restuarant for that matter). The Margherita pizza at Brick + Wood is made with San Marzano tomato sauce, basil, fresh mozzarella, and some evoo and it is quite good. If you’re looking for a classic, or for something simple for the kids, I’d suggest you try this pizza. 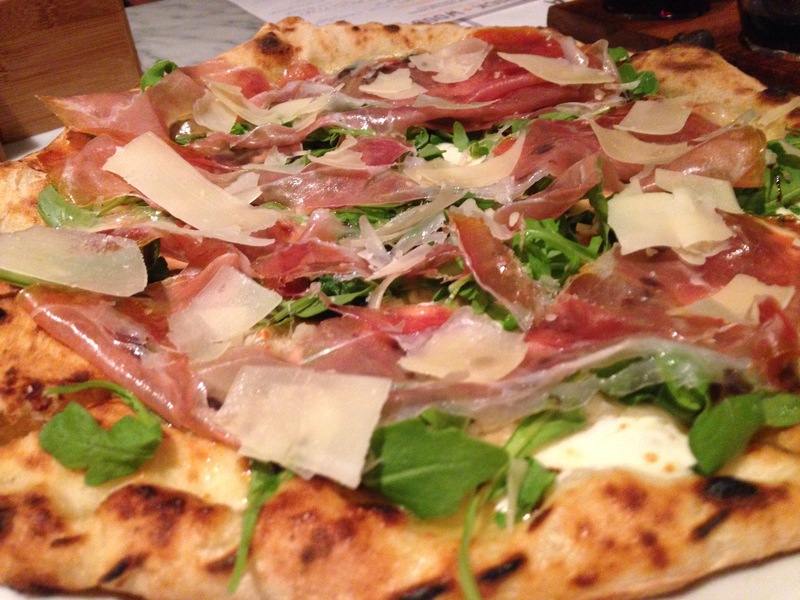 For something more creative I’d suggest you try the Arugula e Prosciutto, a white pizza made with fresh mozzarella, prosciutto, shaved parmigiano, and a touch of balsamic glaze. The flavors are on the light side with this pizza and you can even taste the flavor of the dough and the brick oven. 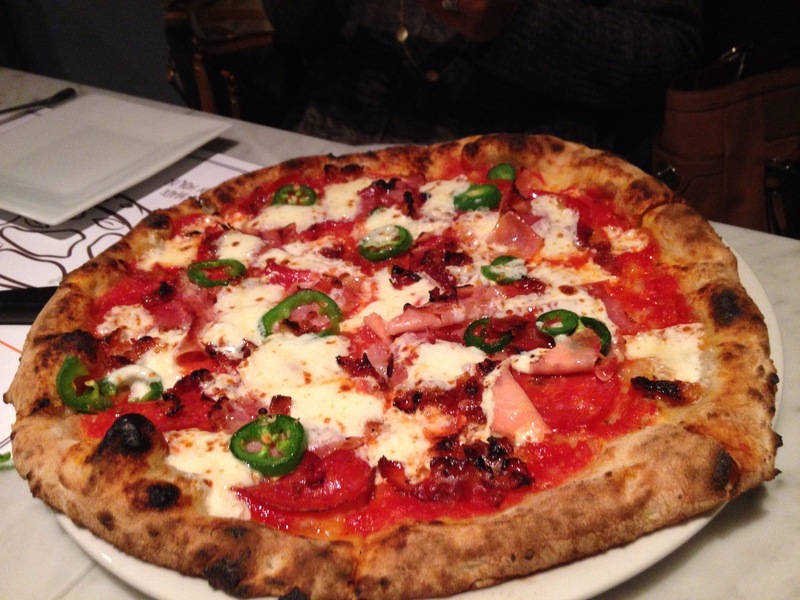 For those who like a little spice on their pizza, try the special “The Spicy Pizza” made with bacon, ham, fresh jalapenos, and spicy honey (or if that isn’t available the next closest pizza is the Diavola or Texas Heat with spicy soppressata, garlic, jalapenos, and oregano). The flavors of this pizza outweight the spiciness, so if you’re looking for spicy and flavorful I’d suggest this one, and I’m going to guess the Diavola has a little more spicy heat to it. The Piccola Toffee cocktail has made my favorites list! 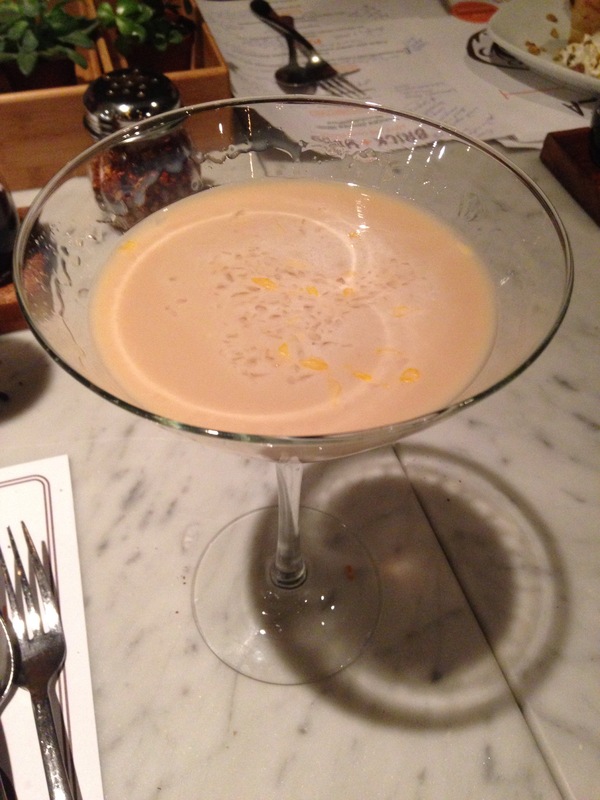 Baileys, tito’s vodka, buttershots, and kahlua are combined to creak a cocktail that tastes like you’re drinking toffee! It’s a perfect cocktail to go with some dessert or just on its own if you feel like something sweet to drink. 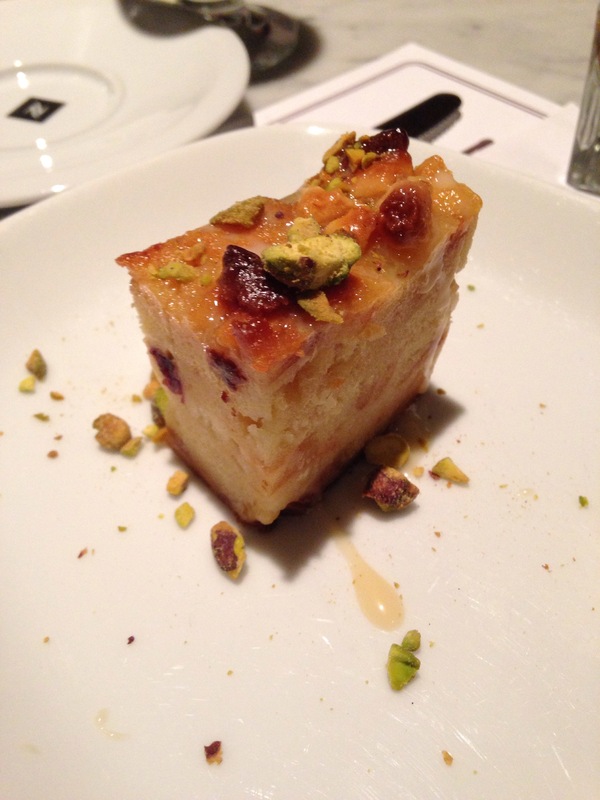 Can we talk about the bread pudding? First, I should say that I am not a fan of bread pudding. It’s usually soggy and too eggy for me, but every once in a while someone makes a bread pudding that makes me like, no love, bread pudding. Clara has succeeded in making me love not just pizza but bread pudding at Brick + Wood. White chocolate and cranberry bread pudding with vanilla sauce and salted pistacios are combined to make this bread pudding which is slightly on the heavy side enabling it to avoid becoming soggy despite the vanilla sauce on top. 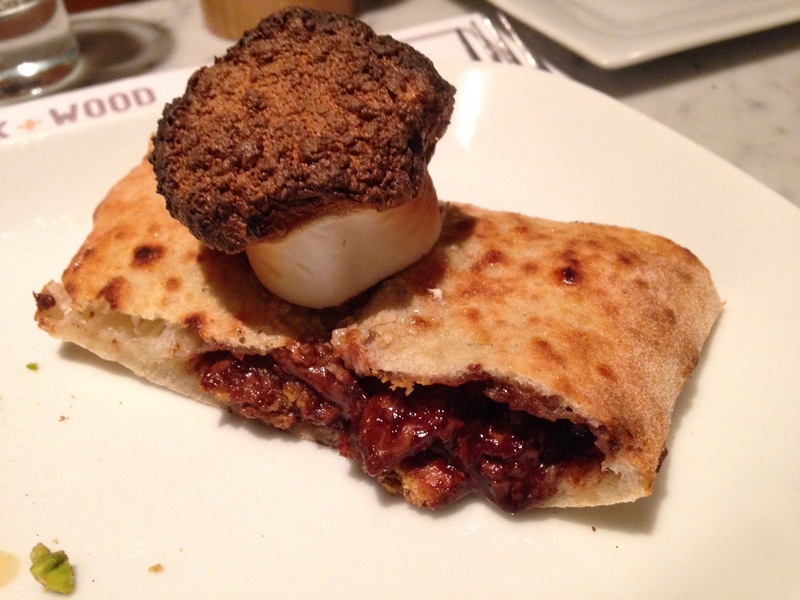 Take all the ingredients of a s’more but substitute the graham crackers with dough and bake it in a 900 degree oven and you have the S’mores Pizza at Brick + Wood. This seems like the perfect dessert for the family to share or anyone who feels like a s’more! Disclaimer: I was invited to this media dinner, however all views and opinions expressed herein are my own. 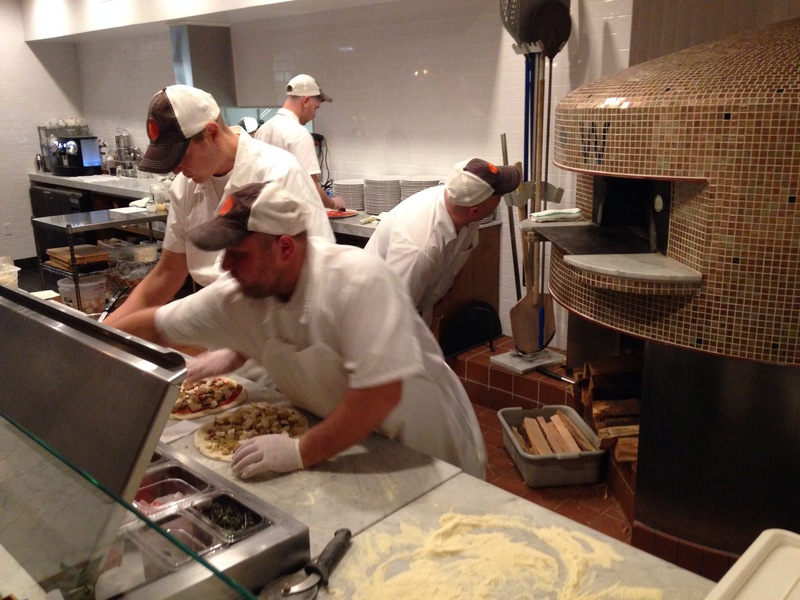 Loved the pizza – dough was wonderful, crusty, chewy, and almost sweet. Can’t wait to go back!